✅ STAND OUT FROM THE CROWD. 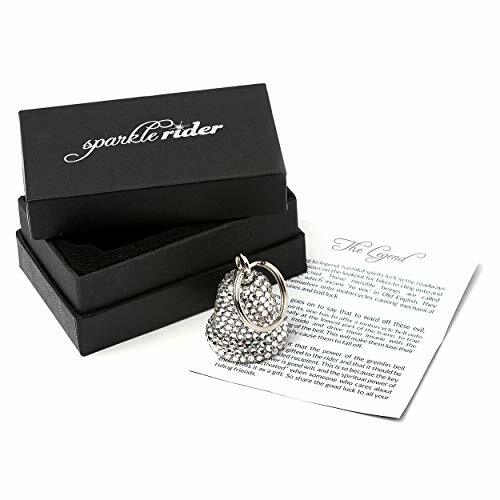 Adorn your bike with this exquisite biker luck bell studded with quality, clear rhinestones that will definitely make it a head turner. Simple yet stylish, this motorcycle accessory is crafted from durable, corrosion resistant zinc alloy, then beset with gems that are the finest of its grade. ✅ SUPERIOR, STUNNING CRAFTSMANSHIP. 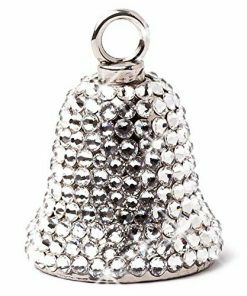 This premium luxury spirit bell is handcrafted with crystals making it elegant, sophisticated, and one-of-a-kind. 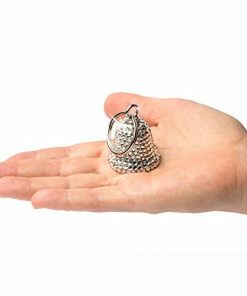 Measuring 1″ x 1.5″ inches, this small but sparkly rhinestone ornament makes for the ideal complement to your gear. 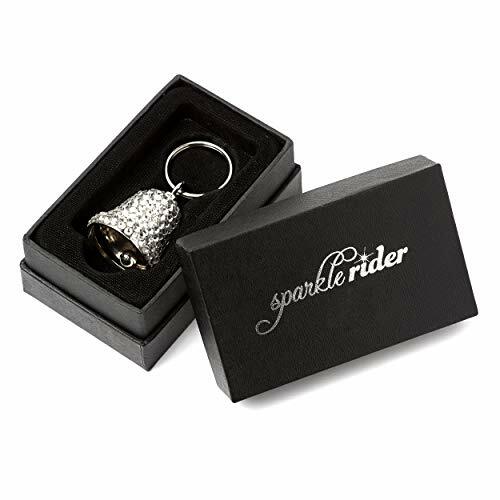 Each piece comes beautifully packaged with a biker bell legend insert and a standard keyring. It is also very easy to mount. ✅ WARD OFF EVIL GREMLINS IN HIGH STYLE. Whether it’s a Harley-Davidson, an Indian, a Triumph, or even a Suzuki, don your ride and keep the bad luck demon at bay with this luxurious lucky charm that can be easily hung to any motorcycle brand. 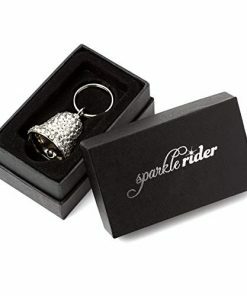 Give your two wheels the same protection as that given by the traditional, pewter bells. Also great for your scooter, vespa or any other 2 or 3 wheel ride. 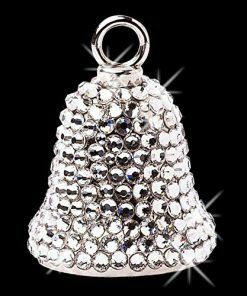 Adorned with high quality, super sparkly acrylic rhinesones, ladies will definitely fall in love with our dazzling biker bells. Give your ride a new vibe whilst protecting yourself from those evil road spirits. We went ahead and took a step forward from the typical material by crafting our biker bells with rust resistant zinc alloy, making it sturdier and long lasting against the harshness of daily use on the road, in any kind of weather. 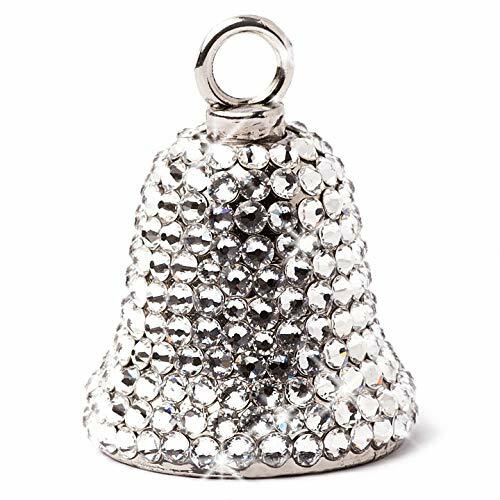 Environmentally sustainable, reusable and recyclable, surely one of the best motorcycle bells for sale in Amazon. 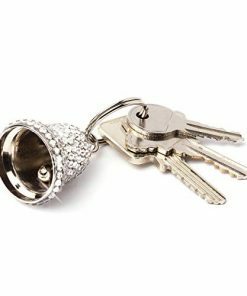 These non-seasonal, shiny, women’s accessory make excellent presents and keychains for lady bikers and motorcyle riders. Make your friends’ mothers feel like a queen or buy them for your relatives and friends who love blingy decorations on any occasion like Valentines Day, Mother’s Day, Thanksgiving, and even Christmas! Show the world how precious your furry friend is to you. 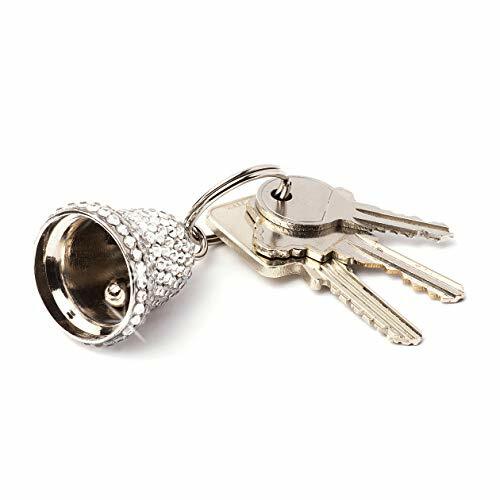 This special metal accessory with rhinestone decor can add glitter and sparkle to your favored companion’s accessories. Works great on cat and dogs collars. Perfect as gifts to fellow pet lovers. We take pride in delivering quality products, and we use the most beautiful, high-quality crystal materials. If, for any reason, you are not satisfied with your purchase, contact us and we’ll surely make it right for you! Buy one now and let the magic work! ✅ THE PERFECT MUST-HAVE FOR ANY BLING LOVER. Whether you’re a motorbike rider, a fashionista, or an accessories collector, have the freedom to be versatile and use it as a keychain, match it with your fashion ensemble as a necklace pendant, or a bracelet piece. Attach it to your pet dog or cat’s collar and make it feel like a prince or princess. ✅ AN ALL SEASON GIFT FOR ANY OCCASION. Double its protective power by giving it to your girl friends as a present. 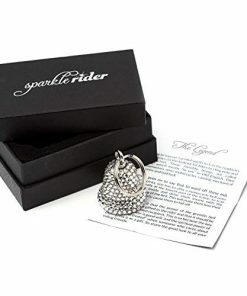 Surprise your fellow lady and female riders, biker girls, bike enthusiasts, girly colleagues, sister, or even your mom with this bedazzled, automotive eye candy on their birthday, wedding, anniversary, graduation, promotion, events, or any holdiay. Copyright 2019 © Sparkle Rider, a division of Buzz Accelerator, Inc.